When I weaned my daughter at 14 months last summer, I felt more than a little undone. Breastfeeding had been integral to my role as a mom, my sense of self, and part of our daily routine. But since my daughter would never take a bottle—please believe me when I say that we tried and tried (and tried)—it also meant I was never able to be away from home for more than a few hours at a time. I knew I was lucky though. I work from home and had a flexible schedule that allowed me to be with my daughter, feed her, and work. 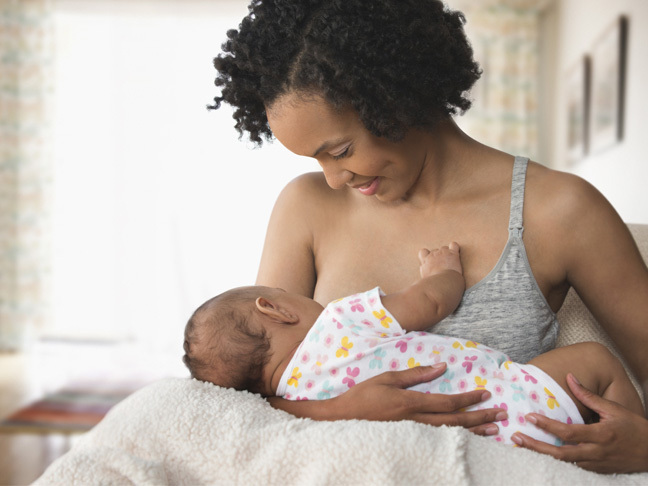 Plus there is this surprising stat: Less than half of all moms reach their goal length of breastfeeding and only 13 percent make it past six months, the recommendation of all major medical organizations. Which is to say that I was also proud of our nursing. Still, when she turned one, was eating well, and naturally less interested in nursing, I started thinking about weaning. (She was never a comfort nurser.) I found very little advice on when to do it and I was really worried about the possibility of weaning-induced depression. For the first few months of motherhood, I didn’t handle sleep deprivation well, I cried almost every night, and I felt like I was walking through mud each day. In retrospect, I should have reached out for more support from either my midwife or a counselor, but it made me more determined not to go through something similar again. So after her first birthday, I took deliberate steps to prevent my soon-to-be diminished oxytocin supply from dragging me down into depression or even extreme sadness. Here are some of the steps I took to guard my mental and physical health during this big milestone. Enjoy the moment. During our last feeding, I told my daughter the story of our nursing relationship—how hard of a time we had in the early weeks when my let down was so fast that she would choke on the milk. I told her how she screamed and screamed during her colicky early months and it was hard for me to know when she was hungry, full, or uncomfortable. I told her that when we got the hang of it, nursing was pretty seamless (apart from the phase when she bit me regularly). And I told her how she was becoming such a big girl and eating food so well that she didn’t need milk from mama anymore. I don’t know how much of it she really understood, but it helped me to reflect on what an awesome journey she and I had together. Wean slowly. Weaning abruptly can reek havoc on your hormones during an already emotional time, so if possible, take your time with weaning. After reading this post from Joanna Goddard while I was still pregnant, I was even more aware of the need to wean slowly. After L turned one, I started to cut out one feeding each week until we were down to just the pre-bed feed. We kept that one for almost a month, so that by the time the final feed came around, my supply and her nutritional need for milk, was minimal. Giving my hormones—and my emotions—a chance to adjust along the way definitely helped me through the process. Tweak your diet. I weaned during the summer so we had a steady stream of green leafy vegetables, berries, and other antioxidant-rich foods in our diet. But I also took a complete omega fats supplement, made sure I was eating a lot of lean protein, stocked up on probiotic foods like yogurt and kefir, and tried to minimize sugary treats. In addition to letting my diet help to guard me against depression, I was also adjusting back to my pre-baby calorie needs. Get sunshine and fresh air. As any busy mom can tell you, the stuck-in-the-house days are the worst. Whenever possible, we got outside for fresh air and a solid dose of Vitamin D each day, which was an instant mood booster. It also helped that I got an endorphin rush every time I had to chase her around the yard— those little toddler legs are surprisingly fast! Take up a new sport. Just before I weaned my girl, I started swimming at our town pool. I learned to swim as a kid and did it every summer in camp, but I hadn’t swum a lap in about 15 years. It took me weeks to feel comfortable doing just one continuous lap of freestyle, but putting my body to work in a new way helped me to feel confident and motivated while my role as a mom was changing. Not into sports? Book yourself a massage or plan drinks out with girlfriends. Ask for help! If you have even the slightest inkling that you might be dealing with depression after weaning, don’t hesitate to call your doctor, midwife, doula, or a good friend. They can help you through your symptoms and most importantly, will remind you that you are not alone with your feelings. They are there to help and want you to be the best mama you can be—use them!